McLaughlin quit his job at 30 to pursue a golf career and test a theory that practicing for 10,000 hours pays off. When he turned 30 about four years ago, Dan McLaughlin, a commercial photographer living in Portland, Ore., decided to dream big. Or more like crazy. Today, he told himself, he might be photographing dental chairs, but someday he'd be playing the Masters Golf Tournament. No matter that he had barely swung a club in his life; he would quit his job and hit the links. "It was kind of an impulsive decision," he says. "At worst, I figured, it's like pre-emptive retirement. 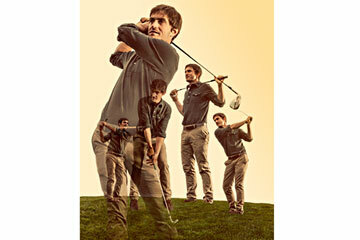 Since we'll all be working in our 90s anyway, might as well do the golf thing in your 30s."